Originally written by Joan B. Garvey and Mary Lou Widmer, this book is widely regarded as the definitive text for tourists, locals, teachers, and students. Complete with a new forward by Barbara Robichaux, a professional French Quarter tour guide, this concise history directs the reader through the diverse traditions and cultures of New Orleans. The updates in this tricentennial edition celebrate the 300-year history of New Orleans, with chapters including details of the city’s founding, changing European rule, slavery, and much more. 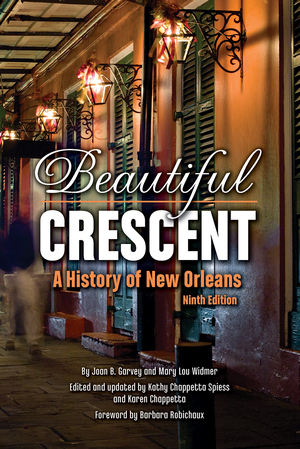 With lists of notable figures and events, this reference volume is a must for historians, tour guides, and lovers of the Big Easy. Joan B. Garvey was a New Orleans public school teacher and administrator and taught New Orleans History and Tour Guiding at the University of New Orleans. She has been a guide for Smithsonian Southern Tours and co-authored Louisiana: The First 300 Years. Mary Lou Widmer, a New Orleanian, is a member of the Louisiana Colonials and the Daughters of 1812. A graduate of Loyola University, she has written several books with Pelican, including New Orleans in the Twenties; New Orleans in the Thirties; New Orleans in the Forties; New Orleans in the Fifties; New Orleans in the Sixties; and Margaret, Friend of Orphans; and co-authored Louisiana: The First 300 Years. Kathy Chappetta Spiess is a short story, poetry, and corporate literature writer. Spiess has served as a judge for the annual Dixie Kane Memorial writing contest, mentoring several fledgling writers in the process. Karen Chappetta and her sister, Kathy, previously co-owned the Tale of Two Sisters bookstores. When not highlighting the history of New Orleans, Chappetta designs quilts for her business, Creative Quilt Designs.